One of the events students took part in was the seminar series about winRT(Windows8 Runtime Environment), HTML5, CSS3. Experts from DevExpress, Microsoft, and Wintellect shared separately on windows8, HTML5&CSS3 and how to build modern UI app for multi-channel experiences using EXTREME tools. First the lecturer introduced the developer’s environment of WinRT and its new features in Windows 8. 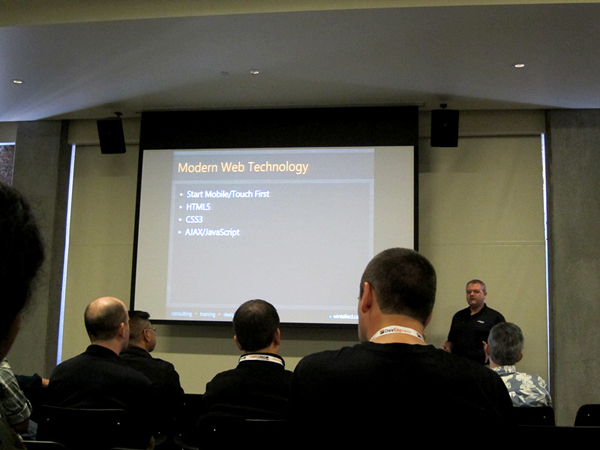 Later they introduced HTML5 and which covers features such as geo-location API, canvas API, and Web storage API. In the end, an engineer from Wintellect introduced their EXTREME tools as an innovative solution for developers who want to create stunning, unified digital experiences across platforms and devices, from Windows 8 to the Apple iPad and, Android. Students gained a better view of the on-going course of Mobile developing and trending tools used in the industry. According to the lecturer, the technology landscape has changed. Developers are expected to build modern unified digital experiences across multiple platforms and multiple devices. With those changes, developers are getting their existing skills pushed to the edge. Students from OIT, Olivet Institute of Technology, received not only knowledge but also built connections with San Francisco’s technology circle to learn from developers and experts. The event’s exhibition hall had a wide variety of vendors showcasing emerging technology along with additional keynote sessions from industry professionals.